Star-shaped and swallowtail-shaped tiny, dark bumps in fine-layered bright bedrock of a Martian ridge are drawing close inspection by NASA's Curiosity Mars rover. This set of shapes looks familiar to geologists who have studied gypsum crystals formed in drying lakes on Earth, but Curiosity's science team is considering multiple possibilities for the origin of these features on "Vera Rubin Ridge" on Mars. 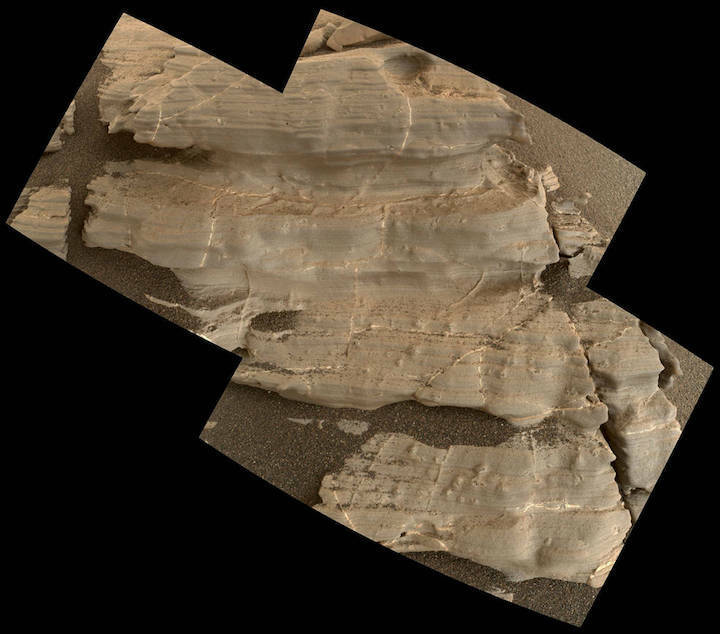 One uncertainty the rover's inspection may resolve is the timing of when the crystal-shaped features formed, relative to when layers of sediment accumulated around them. Another is whether the original mineral that crystallized into these shapes remains in them or was subsequently dissolved away and replaced by something else. Answers may point to evidence of a drying lake or to groundwater that flowed through the sediment after it became cemented into rock. The rover team also is investigating other clues on the same area to learn more about the Red Planet's history. These include stick-shaped features the size of rice grains, mineral veins with both bright and dark zones, color variations in the bedrock, smoothly horizontal laminations that vary more than tenfold in thickness of individual layers, and more than fourfold variation in the iron content of local rock targets examined by the rover. "There's just a treasure trove of interesting targets concentrated in this one area," said Curiosity Project Scientist Ashwin Vasavada of NASA's Jet Propulsion Laboratory, Pasadena, California. "Each is a clue, and the more clues, the better. It's going to be fun figuring out what it all means." Vera Rubin Ridge stands out as an erosion-resistant band on the north slope of lower Mount Sharp inside Gale Crater. It was a planned destination for Curiosity even before the rover's 2012 landing on the crater floor near the mountain. The rover began climbing the ridge about five months ago and has now reached the uphill, southern edge. Some features here might be related to a transition to the next destination area uphill, which is called the "Clay Unit" because of clay minerals detected from orbit. The team drove the rover to a site called "Jura" in mid-January to examine an area where -- even in images from orbit -- the bedrock is noticeably pale and gray, compared to the red, hematite-bearing bedrock forming most of Vera Rubin Ridge. 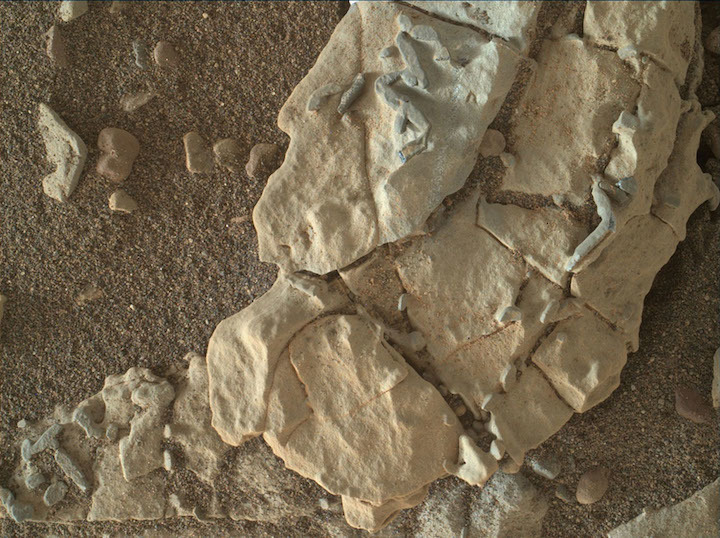 "These tiny 'V' shapes really caught our attention, but they were not at all the reason we went to that rock," said Curiosity science-team member Abigail Fraeman of JPL. "We were looking at the color change from one area to another. We were lucky to see the crystals. They're so tiny, you don't see them until you're right on them." The features are about the size of a sesame seed. Some are single elongated crystals. Commonly, two or more coalesce into V-shaped "swallowtails" or more complex "lark's foot" or star configurations. "These shapes are characteristic of gypsum crystals," said Sanjeev Gupta, a Curiosity science-team member at Imperial College, London, who has studied such crystals in rocks of Scotland. Gypsum is a form of calcium sulfate. "These can form when salts become concentrated in water, such as in an evaporating lake." The finely laminated bedrock at Jura is thought to result from lakebed sedimentation, as has been true in several lower, older geological layers Curiosity has examined. However, an alternative to the crystals forming in an evaporating lake is that they formed much later from salty fluids moving through the rock. That is also a type of evidence Curiosity has documented in multiple geological layers, where subsurface fluids deposited features such as mineral veins. Some rock targets examined in the Jura area have two-toned mineral veins that formed after the lake sediments had hardened into rock. Brighter portions contain calcium sulfate; darker portions contain more iron. Some of the features shaped like gypsum crystals appear darker than gypsum, are enriched in iron, or are empty. These are clues that the original crystallizing material may have been replaced or removed by later effects of underground water. 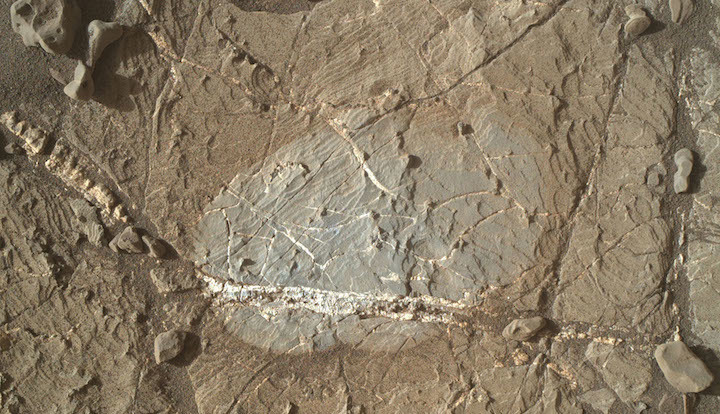 The small, stick-shaped features were first seen two days before Curiosity reached Jura. All raw images from Mars rovers are quickly posted online, and some showing the "sticks" drew news-media attention comparing them to fossils. Among the alternative possibilities is that they are bits of the dark vein material. Rover science team members have been more excited about the swallowtails than the sticks. "So far on this mission, most of the evidence we've seen about ancient lakes in Gale Crater has been for relatively fresh, non-salty water," Vasavada said. "If we start seeing lakes becoming saltier with time, that would help us understand how the environment changed in Gale Crater, and it's consistent with an overall pattern that water on Mars became more scarce over time." Such a change could be like the difference between freshwater mountain lakes, resupplied often with snowmelt that keeps salts diluted, and salty lakes in deserts, where water evaporates faster than it is replaced. If the crystals formed inside hardened rock much later, rather than in an evaporating lake, they offer evidence about the chemistry of a wet underground environment. Variations in iron content in the veins, smaller features and surrounding bedrock might provide clues about conditions favorable for microbial life. Iron oxides vary in their solubility in water, with more-oxidized types generally less likely to be dissolved and transported. An environment with a range of oxidation states can provide a battery-like energy gradient exploitable by some types of microbes. "In upper Vera Rubin Ridge, we see clues that there were fluids carrying iron and, through some mechanism, the iron precipitated out," Fraeman said. "There was a change in fluid chemistry that could be significant for habitability." 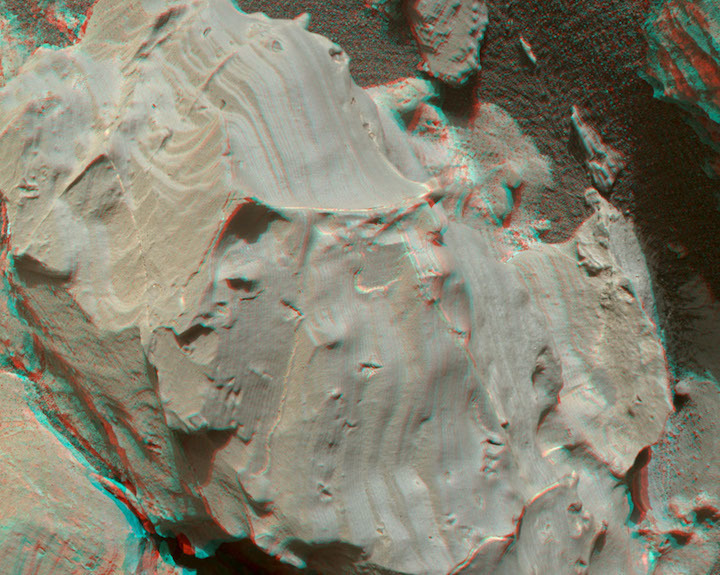 The surface of the Martian rock target in this stereo image includes small hollows with a "swallowtail" shape characteristic of some gypsum crystals, most evident in the lower left quadrant. These hollows may have resulted from the original crystallizing mineral subsequently dissolving away. The view appears three-dimensional when seen through blue-red glasses with the red lens on the left. The scene spans about 2.5 inches (6.5 centimeters). This rock target, called "Funzie," is near the southern, uphill edge of "Vera Rubin Ridge" on lower Mount Sharp. The stereo view combines two images taken from slightly different angles by the Mars Hand Lens Imager (MAHLI) camera on NASA's Curiosity Mars rover, with the camera about 4 inches (10 centimeters) above the target. Fig. 1 and Fig. 2 are the separate "right-eye" and "left-eye" images, taken on Jan. 11, 2018, during the 1,932nd Martian day, or sol, of the rover's work on Mars. The dark, stick-shaped features clustered on this Martian rock are about the size of grains of rice. This is a focus-merged view from the Mars Hand Lens Imager (MAHLI) camera on NASA's Curiosity Mars rover. It covers an area about 2 inches (5 centimeters) across. The focus-merged product was generated autonomously by MAHLI combining the in-focus portions of a few separate images taken at different focus settings on Jan. 1, 2018, during the 1,922nd Martian day, or sol, of Curiosity's work on Mars. This rock target, called "Haroldswick," is near the southern, uphill edge of "Vera Rubin Ridge" on lower Mount Sharp. The origin of the stick-shaped features is uncertain. One possibility is that they are erosion-resistant bits of dark material from mineral veins cutting through rocks in this area. The Mars Hand Lens Imager (MAHLI) camera on NASA's Curiosity Mars rover took this image on Jan. 17, 2018, during the 1,937th Martian day, or sol, of Curiosity's work on Mars. The grayer area in the center is roughly 2 inches by 3 inches (about 5 by 8 centimeters). That area, including a portion of the vein, was brushed with the Curiosity's wire-bristled Dust Removal Tool before the image was taken.